Women’s role in society has a great impact on the economy- and indeed, is an influence of progression. According to a McKinsey research, increasing women’s participation in the workforce in GCC alone would add US$180 billion or a 7% increase to the economy in 2025- an optimistic possibility for the business scene in the region. 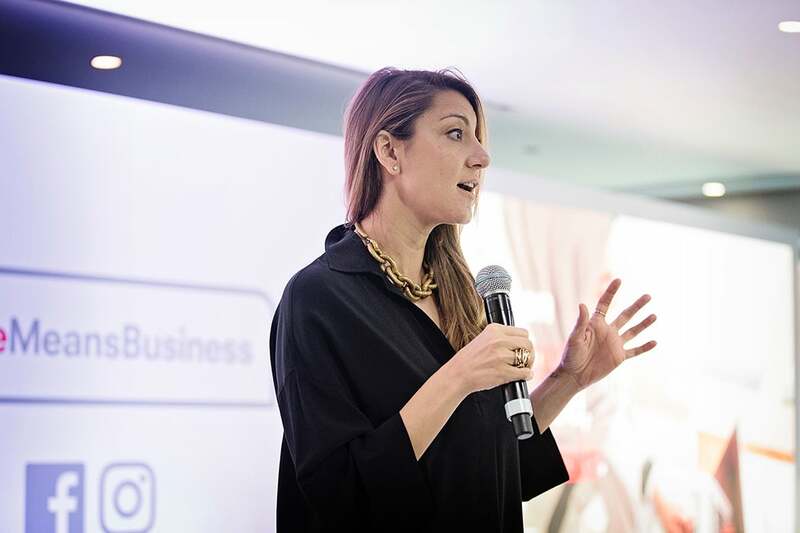 In the spirit of encouraging women’s participation in business, Facebook launched the global initiative #SheMeansBusiness in MENA on February 22, 2017 in Dubai, UAE. The event welcomed attendees, including Nicola Mendelsohn, VP EMEA at Facebook, Clare Woodcraft-Scott, CEO of Emirates Foundation, with a short discussion from its partners Francesca Capobianchi, SMB Community Engagement Program Manager at Facebook, Dina Sheriff, CEO, Ahead of the Curve, and Najla Al-Midfa, General Manager of Sheraa Sharjah. It also featured a quick panel from a few of the platform’s startups: Mai Medhat, CEO and co-founder of Eventtus, Iman Ben Chaibah, founder and CEO of Sail Publishing, and Sarah Beydoun, founder of Sarah’s Bag. #SheMeansBusiness aims to train women entrepreneurs, women-owned and women-led businesses to utilize and leverage Facebook and Instagram for their business. Rasha Kashkoush, Facebook Corporate Communications of the MENA & Turkey region says that, “it’s an initiative to help give more women with great business ideas the opportunity, support and practical advice they need to turn these ideas into reality.” For its MENA market, Facebook has partnered with UAE initiatives Sheraa Sharjah and Emirates Foundations to build a network of UAE-based startup incubators, NGOs and women’s organizations to reach their goals, says Kashkoush. While in Egypt, Facebook has partnered with Ahead of the Curve in Egypt to lead in growing a team of partners to extend its reach among women in the region. Using workshops, training sessions and online resources, along with its community to provide support, it seeks to provide users insights, skills and network to scale their business online. For female entrepreneurs, it’s certainly an indication of advancement, and we can’t wait to see its fruition. “[Participants would receive] training, learning and community. #SheMeansBusiness will give more women with great business ideas the practical advice they need to turn those ideas to reality. We’re working with our partners in the region to provide advice, knowledge and tools that will give more women across the MENA the support they need to continue growing. Specifically, Facebook and Instagram are fueling small business growth- it’s a great way for SMBs to reach existing customers and find new ones, simple because it’s where people are spending their time."